Campfire stories provide creative entertainment without need for anything but a speaker and an audience. In the day of portable DVD players, iPods, text messages and cell phones, it's important to unplug and share a bit of family time around a fire. 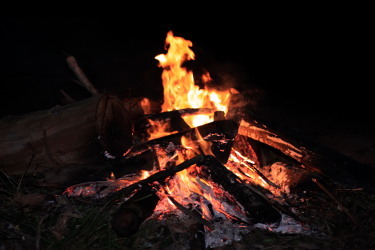 A story at the campfire is more than just entertainment, it's a time to reconnect with each other, Using your imagination and sharing it with the ones you love. Campfires set the mood for a great camping trip. One thing that children often look forward to is sitting around the camp fire at night roasting marshmallows and telling scary stories. It makes the trip exciting, something different that you do not get to do at home. It's great because the stories bring the family together for a little quality time. The best stories are the funny stories that get everyone laughing - or maybe a spooky story that ends with a fright, giving a chance for everyone to huddle close for a while. A quiet woods and a roaring fire is the perfect place for campfire stories. Stories help add to the ambiance of camping, especially when told at night right before everyone goes to sleep. They also create a great memory for parents and their children to share. You know, someday it will be "Remember the time we went camping and Dad told that creepy story about..."
If you're like me and struggle to tell a good story, especially when your kids ask you all of a sudden, "Tell us a story Dad"! Then just put some thought into it before hand (like now) and make something up, the main thing is have a go, the more you try the better you'll get. Share Your Campfire Story with Us! fellow campers! Talk to us about your experiences on a camping trip. Was it happy, sad, funny, or scary?